About two and a half hours north of Nairobi, in the highlands near Mt. 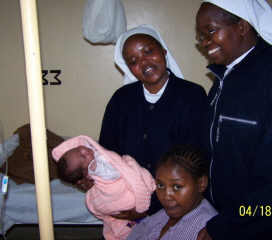 Kenya, the Missionary Sisters provide healthcare for the poorest people who live in the region. 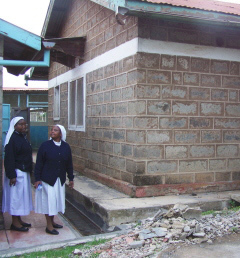 For many of those living in this area of central Kenya, Mary Immaculate Hospital is their only hope for medicine and professional assistance if they become sick. While many Americans might not understand the remoteness of poverty of this region, the territory where the hospital is situated is so poor that only recently were the Sisters able to obtain water for the hospital itself. Prior to that, our Sisters would have to walk to a local river to get water for themselves and the patients. Needless to say -- we thank God for the gift of water there! 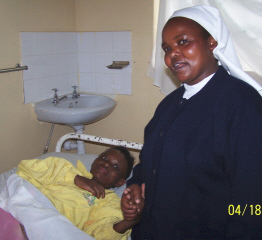 Because Mary Immaculate Hospital offers medical care for some of the poorest people of Africa, the Sisters rely on charitable donations to fund the continued working of the facility. At this moment, this hospital as well as other medical facilities are in desperate need of medicine and basic medical equipment. The Sisters hope to purchase several pieces of used x-ray equipment which would help in the diagnosis of tuberculosis in adults as well as children. Without a doubt, this could save the lives of countless men, women and children!